Peace-keepers, heroes, reluctant partners – all of these terms apply to The Swords of Findalay. This international peacekeeping quartet was put in place long ago to help settle disputes and punish those who violate the Treaty of Findalay. The Swords of Findalay are four of Canus’ most accomplished adventurers joined together in a party for the betterment of the continent. One adventurer is chosen by his or her country’s leaders to join The Swords for a ten-year term. Swords may serve as many consecutive terms as they like and their leaders allow. The Swords of Findalay are above all laws but their own, so they are supposedly selected based not only on their accomplishments, but their character… but character is quite subjective. More often than not the leaders of a country pick their most popular and storied hero to serve as a Sword. Other countries don’t want to be outdone and so The Swords of Findalay can sometimes become showboating drama queens out for individual glory and popularity as opposed to a cooperative team of negotiators and adventurers. Though recent events have encouraged a more careful picking of The Swords. Meet the current Swords of Findalay, who are in their tenth and final year of their term. Aeranore’s champion is a demure, middle-aged gnome woman. She dresses plainly, abhors makeup, and keeps her hair in a tight bun. Queen Icillia IV didn’t appoint her close friend for her appearance. Mikandra Felonde is a renowned conjurer. She and her many summoned beasts have a rich history saving citizens of Aeranore from various threats – particularly the terrorist organization of Free Aeranore. An artisan turned warlord who rose through the ranks of the Bragonay caste by order of Empress Nawja herself is far and wide considered the most honorable fighter in all the land, which is a major accomplishment considering her predecessor literally stabbed the other Swords of Findalay in the back. In her early days, Therrah gained fame as an artisan when she made armor out of the hides of dragons… whom she personally hunted down and killed with her axe. When her fame reached international levels the Empress forced a warlord to trade castes with Therrah and later asked her to join The Swords. Therrah is well-mannered and respectful of other nations and cultures. Training is her number one priority and she is soft-spoken… until she gets a few ales in her. Therrah becomes the life of the party and center of attention whenever she starts to drink. This is a little dangerous though. How lose her tongue becomes is proportional to how much she’s had to drink. There is no voice in Findalay as sweet as that of Leiryiach Lekjaver the bard. Leiryiach is a dragonborn who has grown popular in the isles by calming monsters and beasts with his songs and spells. He has laid down almost as many beasts as he has women – his one true weakness. Leiryiach is easily the voice of The Swords of Findalay. He often sings when they give public appearances and is the first to show off when challenged. Leiryiach craves attention and pulls pranks on his fellow Swords when they are being honored in order to draw attention back to himself. Leiryiach might be the voice of The Swords, but Justinianus is their true leader. He is a calm and collected Solarist priest who has made his name through adventuring and then giving away his gold to the poor. This made him wildly popular in Taliana where he could easily be a senator. Parliament naturally saw him as a political threat (he could take one of their seats) and immediately nominated him to be Taliana’s Sword as soon as the opportunity arose. His work as a Sword bars Justinianus from running for office. Justinianus often picks the quests The Swords of Findalay undertake when they are not needed to settle a dispute. When they are needed, he is a skilled mediator, helping leaders everywhere come to agreements during disputes. Though he has stated when his term as a Sword is over he does not plan to stay, but run for Taliana’s Parliament, which has worried more than a few in the House of Labor. The primary responsibility of The Swords of Findalay is to keep the peace between Findalay’s nations. They have two primary ways of doing this. When another nation or leader of a large-scale, internationally recognized organization such as The Arcane College asks them to help mediate a dispute between themselves and an opposing party, The Swords must heed the call. Likewise, before any military action is taken The Swords must first be called upon. Nations and organizations who do not take that step are subject to penalties determined by The Swords of Findalay. The Swords must provide an example for all of how the different Findalayan countrymen can work together. This means public appearances, speaking-events, and above all adventures. If a Aeranorean gnome can become a hero to young Bragonian dwarves and Talianan elves, then people may be able to better understand one another. There’s plenty of places for The Swords of Findalay to explore and plenty of adventure out there. Since The Swords of Findalay are so very busy, they have a few special tools to manage their jobs. Each has a special stone of sending which allows communication with one another and the leaders of Findalay. They are also loaded up with scrolls of teleportation so they can easily get from one place to the next, not to mention their griffon mounts given to them by Taliana’s Parliament. In order to not show favoritism to any nation over the others, The Swords of Findalay spend two and a half years, one-quarter of their term, in one of Findalay’s four nations, using it as a base of operations. Their base is usually located in a the country’s capital. The Swords of Findalay came about after years and years of war between all of Findalay’s countries. Aeranore, Bragonay, Marrial, and Taliana agreed to create a force made of their champions that would be the continent’s police force. They have not always been successful in negotiations, but they always take action and pride themselves on hunting and punishing the guilty. The Swords of Findalay have had numerous major accomplishments. One of their biggest was uncovering the grain plot of Taliana and offering Parliament a choice in their punishment, the result of which was damning to the country’s economy. Perhaps one of the most important moment in The Swords’ history is the event that started the Fourth Great War. Bragonay’s Sword murdered the other three and then the empress of Bragonay began her invasion. The Swords murdered and the war begun, for a long time there was no Swords of Findalay. Ten years ago the countries brought the group back, but many people are wary of The Swords, unsure if they truly put the needs of Findalay above the needs of their individual patriotism. So how are The Swords of Findalay important to the PCs? Well, first of all they are the highest moral authority in Findalay, an example to all adventurers. 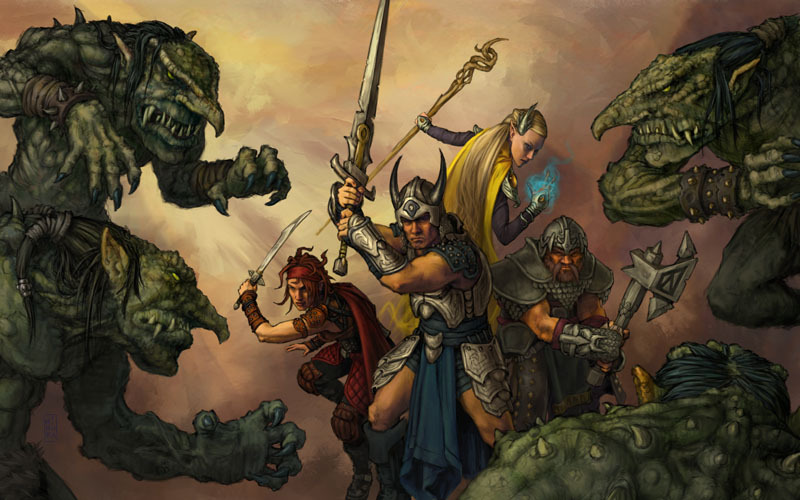 Second, these adventurers have real authority, they could ask the PCs for help, or with the term ending, one of the PCs could be chosen to be a Sword. Or perhaps the adventurers find themselves at odds with The Swords. The adventurers could work with an organization sparking an international incident or perhaps The Swords themselves have ulterior motives, either individually or as a team. 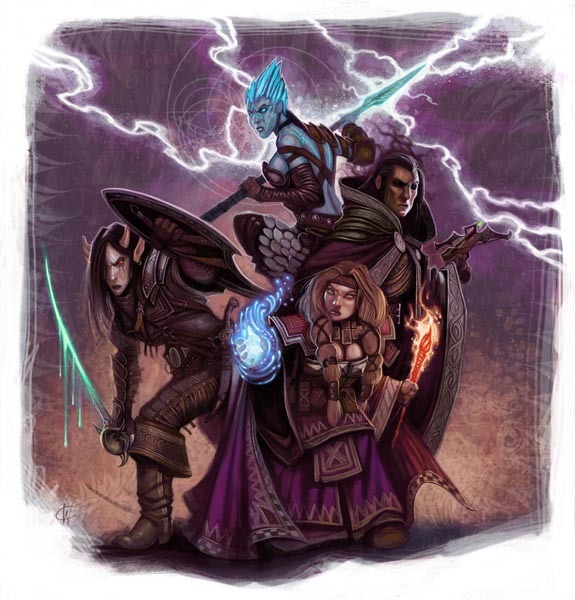 Imagine the best adventuring party in the world gone rogue. Fun stuff.